Mobile devices have proliferated into most working and private areas and broad user groups have access to mobile technology. 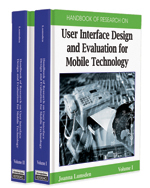 This has considerable impact on demands for usable designs. As users differ widely regarding age, upbringing, experience and abilities, it is a basic question whether there are user interface designs feasible that meet the demands of user diversity and trans-generational designs. The aim of the present research was to uncover effects of user diversity on menu navigation. Users of a wide age range were examined when interacting with mobile phones. In a detailed way, individual navigation routes were analyzed and effectiveness and efficiency of menu navigation was determined. In addition, effects of individual variables were considered. The results show that the usage of small-screen devices imposes considerable difficulties for all users, but in particular for children and middle-aged adults, who were very sensitive for cognitive demands imposed by current mobile phone designs. Ease of Use: The ease of use describes the extent to which users believe a technical system to be free from effort and easy to handle. Spatial Ability: It is conceptualized as the ability to mentally manipulate and integrate visual stimuli consisting of more than one part. This includes the ability to imagine of rotations of objects or their parts. Navigation Performance: The term navigation in this context describes the process of moving through a menu structure in order to retrieve information or choose functions. The individual navigation routes the users take while searching for a specific target function may give valuable insights into shortcomings of menu design. Effectiveness: The term reflects the degree to which system objectives (e.g., tasks) are being achieved. Verbal Memory: Verbal memory is the basic ability to store and retrieve verbal or semantic information without additional processing. Usability: The term describes users’ effectiveness, efficiency, and satisfaction with which users achieve specified goals in a technical system. Efficiency: The term describes the degree to which a certain performance is achieved in terms of productivity. For example, it can be analyzed how many detouring routes are carried out until users reach their targeted goal in the menu, and how often they return to higher levels in menu hierarchy to re-orientate. Trans-Generational Designs: Trans-generational designs are interface designs, which are usable and understandable by a broad user group, thus meeting the needs and demands of user diversity. They aim at coming up with developmental (cognitive, physical and sensory) specificities, which are present in users of different ages.